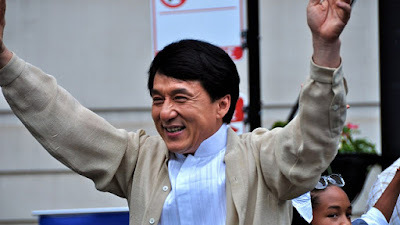 Jackie Chan landed 38th on Forbes' latest celebrity rich list, making him the second highest-paid actor in the world. While Chan hasn't starred in an American live action film in five years, he's pocketed an estimated 50 million USD over the past 12 months, second only to American actor Robert Downey Jr., who came in 8th place on the list with 80 million USD in earnings. His latest film Dragonblade, which hasn't seen a US release yet despite starring big Hollywood names including Adrien Brody and John Cusack, grossed 120 million USD in China, and it's estimated that Chan took at least a 10 million USD cut. Chan-branded merchandise has also, as you can expect, contributed massively to his fortune. The actor owns a Segway dealership and a chain of Cinemas named for him. And as you may recall, the Jackie Chan Film and Television Academy opened its doors in Wuhan just a couple of months ago. “Jackie Chan is basically the Mickey Mouse of Chinese culture, a celebrity who is so omnipresent that his name has become shorthand,” Grady Hendrix, cofounder of the New York Asian Film Festival, told Forbes. Since business success in China ultimately revolves around navigating or benefiting from the government, Chan has a secret weapon in all this earning: membership in the Chinese People’s Political Consultative Conference, a hugely influential government board. Beijing green-lights all films released in China. It’s an increasingly powerful position. Chinese cinemas have grown at a nearly 33% rate over the past five years, generating just shy of $5 billion in 2014; in February China’s monthly box office receipts actually surpassed those in the U.S. And while an American blockbuster can gross a quarter-billion dollars in China, the country’s powers-that-be often institute weeks-long blackouts of foreign films or slot them against one another on opening weekends. As a result Hollywood is turning to coproductions with Chinese companies, with Transformers: Age Of Extinction and Iron Man 3 among the most successful examples. Forbes has estimated Chan's net worth to be around 350 million USD, although the star's publicity team has declined to confirm this. Boxers Floyd Mayweather (300 million USD) and Manny Pacquiano (160 million USD) topped this year's Forbes list, followed by Katy Perry (135 million USD) and radio host Howard Stern (95 million USD).